The 2-lamp ESL spotlight from the -DecoSystems- range lacks nothing except a DecoSystems lampshade of your choice, to provide the perfect decorative touch. This enables you to create a completely individual product. 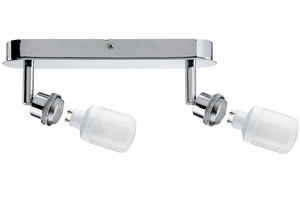 The product includes a lamp, ESL round bulb 9В W GU10, on delivery and is suitable for wall and ceiling mounting. The generous light distribution is ideally suited to general purpose room illumination.